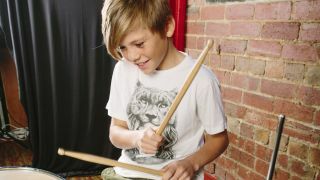 Could this young chap be a drumming star of the future? PRESS RELEASE: Yamaha Drums is delighted to announce the launch of #FUTUREBEAT - a groundbreaking new national drumming competition that offers a mouthwatering array of prizes, unique performance opportunities, and maximum exposure for drummers aged 18 years and under. Partnered by Yamaha drum dealers throughout the UK, #FUTUREBEAT is described by George Daniel, drummer for chart-topping rock band The 1975 as, "a great platform for young drummers that provides a level playing field for showcasing new talent." The 1975 formed while at school and, with two number 1 albums among a long list of international credits, Yamaha Drum Artist George Daniel knows exactly what it takes to succeed and is proudly supporting and promoting the #FUTUREBEAT competition. With a Yamaha Live Custom Drum Kit awarded to the overall #FUTUREBEAT winner, professional development from artist mentoring sessions for the grand finalists and prizes for all regional finalists, this is a do-not-miss-opportunity for anyone under the age of 18 who plays drums. Judges will be looking for groove, timing, technique, versatility and expression. The video can be filmed as simply as on your smartphone. You will be judged on your performance, not the production of the video. From the video submissions, 60 young drummers will be selected to perform live on either a Yamaha Stage Custom or DTX Electronic Drum Kit at six regional finals that will each showcase 10 drummers. These drummers will play for up to a maximum of 10 minutes in front of audiences comprising family, friends and members of the general public. All regional finalists will win a Yamaha drum pedal and the regional winners will each win a Yamaha RC Series snare drum. For the grand final at Yamaha headquarters in Milton Keynes, the 6 finalists will each receive mentoring with some of the country's leading professional drummers and have the chance to perform with a professional band in front of a judging panel of industry experts. A selection of judges from the industry will face the difficult challenge of deciding the overall #FUTUREBEAT winner. Yamaha's Drum Product Marketing Manager Gavin Thomas comments, "We believe #FUTUREBEAT could become one of the most important drum events of the year for many years to come. The UK has a lot of talented and aspiring drummers and we are giving them the opportunity for exposure in front of many influential industry figures. We hope it can help kick start many careers." He added, "I would sincerely like to thank all our participating drum dealers for dedicating their time and energy to this fantastic project also. The industry needs good local drum shops and we hope this project will also help to highlight and widen the awareness of these great partners." For full details including prizes, terms and conditions visit the Yamaha UK website.